After talking with Shiv about his fantastic book on building a source of passive income through Kindle Publishing, we asked him to share a few of his best tips from the book with us in order to help any of you who are also exploring the Kindle Publishing realm. He was gracious enough to write up a blog post summarizing 6 steps to creating a passive revenue stream through Kindle Books. ‘Secrets Of Kindle Publishing Empire’ is the concluding and most critical part of the 3-part series ‘Kindle Self-Publishing Mastery’. I have revealed all my strategies, tools, and techniques in this book, apart from laying out in detail the hugely lucrative passive income business model. This is the exact same model I have been using for past 3 years to generate a 5-figure passive income on the side. Anyone that can write a simple email can pick up this book and learn how to build a passive income-generating online business around non-fiction Kindle books. I started out small and from the ground up in this business. I took baby steps, got to make my share of mistakes, learned lessons from them and grew slowly. Then I realized reinventing the wheel is not the smartest way, so I approached and learned from coaches such as Gerry Roberts, T Harv Eker, Alex Jaffreys, Matt Lloyd, and Alex Mandossian. Interestingly, none of them are from the Kindle publishing world. But the beauty of this is that I could apply their teachings to this business and get quicker results. I also got a chance to learn from Dave Chesson and Joanna Penn about Kindle publishing – and I highly recommend following their work in Kindle publishing field. This book is the result of these lessons and based on concrete results I am getting in my business. Although I’ve managed to keep the book limited to cover essentials, here is what the book covers, in a nutshell. The first lesson I learned the hard way – after not being able to earn a dollar in the first 9 months of my online business – is that there is one secret ingredient that changes everything. This ingredient is so powerful that it even beats qualification, background, and connections as far as finding success in a business is concerned. It is – the Mindset. It was quite painful to realize and accept that my mindset was blocking me from tasting success. I understood that I was sabotaging my own chances of being successful. Once I internalized this truth, I began to work on what I call ‘mindset hacks’. For instance, I was a perfectionist. If you are one, you know how we work. In my previous life as a program manager of a successful Software product development company, I would take 2-3 hours to write a business email. And after sending it I would fret over it again wondering if I could have written it better. When I learned about Pareto’s 80-20 principle and how it applied to pretty much everything we do, a light bulb went on. All I had to do was to focus on identifying those 20% actions that produced 80% of results. This was a game changer and enabled me to write and publish 8 Kindle books in a span of 2 months. Or for that matter, taking imperfect actions to get quicker results. This is a lesson I learned from my first coach. Being a perfectionist kills your momentum. If you are able to take quick imperfect actions you’ll go a long distance in creating passive income quickly. I started publishing books at the point when I knew that I had packed in enough value. I could work on it for another 2 weeks or so and make it a masterpiece if I worked on the sentence structure and such. Also, if I took that route then at the end 2 weeks I would find something else to ‘make it perfect’. By taking the ready-fire-aim approach you’ll get more things done. I have explained 7 more mindset hacks that made a world of difference in my business, which I believe will help anyone looking to make quick progress in building passive income streams. Writing a book that is full of value is, of course, the first step. Yet, with 4 million+ books and close to 500,000 new Kindle titles being added each quarter, what are the chances of your book being seen by your prospective buyer? But, if you do a few specific things in a specific way – you can make sure that Amazon itself will flash your book in front of your prospective customer when she is surfing Kindle books. Amazon will not only show your books in various sections, it will even follow your prospective customers to their inbox and recommend they buy your books! Can we apply Pareto’s 80-20 principle to Kindle publishing business? Of course, we could – it is 20% writing and 80% marketing. Surprised? The secret is that you cease to be an author the moment your writing is complete. In fact, you are not an author marketing your books, you are actually an entrepreneur writing Kindle books. In order to succeed in Kindle publishing business, you should wear the writer’s hat only when you are writing the book (which, incidentally can be done over a weekend as per the process I’ve laid out in the second book of this series). The rest of the time you are an entrepreneur planning marketing strategies to get your book to Best Seller #1 and increase revenue. I have shared 6 techniques I use to get my books to Bestseller #1 position in the categories they are listed in. Now, why is this required? Getting your book to #1 Best Selling position increases your revenue for sure, but you are an entrepreneur and you’ll see this from the marketing angle. It builds your brand and gives more exposure to your business. This is where the magic happens. We live in a world where information and communication is a form of currency. If you can leverage public platforms to effectively manage the basics – that is, locating your target group, connecting with them, providing insane value and radiating this fact to them – all of which can be done without spending a dime, you can ensure that your books will become quite popular. The same goes for you as an author. Would you read reviews of the upcoming book by your absolute favorite author? I’d run and grab a copy without waiting for others to tell me if the book is good. The same goes for you – as you build your brand you will build a following that will be on the lookout for your next book. Not only this – they’ll follow you socially, to your author-site and blog, and then they will pester you for more value. This would be a great way to help your audience further, and – you guessed it – increase revenue for your business. 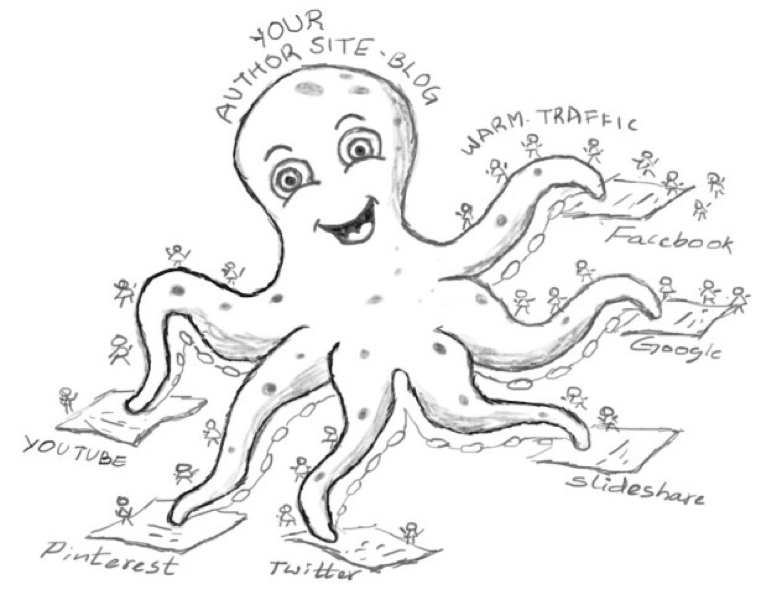 Imagine you having a system that like an Octopus spreads its traffic sucking tentacles to every nook and corner of the Internet and pulls in your target readers to your website. More importantly, what would this do to you if you could automate the whole process? A good passive income business plan not only gives you a blueprint to the entire sales funnel, it also shows you ways to automate large parts of your business. It gives you Profit Enhancers. A profit enhancer method gives you tools to increase your Customer Lifetime Value (CLV). It is a known fact that acquiring a new customer is more expensive than retaining existing customers. A happy customer will buy more from you, repeatedly. Because she trusts you and knows that you want to help her succeed. As long as you help them reach their goals, you’ll be able to earn more from your existing customer. This increases your CLV. Then there are Profit Maximizers. These are the tools that take your business to the next level. What if you got a customer that paid 99 cents for your Kindle book and ended up paying you $197 for something else you had to offer, without much selling to be done on your part? That would maximize your profits like crazy. And that’s exactly what you’ll learn in this section of the book. As your business grows you will include Profit Maximizers into your business and scale it up. Knowing these possibilities will help you make several decisions about your business upfront – including, potentially, choosing your niche to write the Kindle non-fiction books in the first place! I couldn’t ‘pollute’ the business plan section by throwing in all the techniques and strategies I use, so I carved out a separate section. One such technique I use to maximize my earnings (from unexpected sources, I’d say) for ZERO additional work on my part, is Geniuslink. ..so I know how much of traffic each set of books is bringing in. Based on this I can fine-tune my marketing campaigns. Remember, since I have signed up as an Amazon Associate for some of the Amazon storefronts in English-speaking countries I not only get 4% commission from my OWN book sales, but I also get sale commissions for other Amazon items that my readers buy after clicking the geni.us links to my books. This is extra passive income for ZERO effort. That is why I consider Geniuslink to be truly a genius idea. It leverages advantages of Amazon’s policies and helps you earn more from customers around the world. Here is the screenshot of the additional commissions I’m earning from people who clicked the link to my book and went on to purchase other products from Amazon. As I explained, all this revenue comes in with ZERO additional work and very limited marketing spend. I also see that these links are propagated and get referred from other domains as well, which of course is good news for me as it increases my book royalty and Amazon commissions. Just recently I utilized Geniuslink’s Advanced link building feature to promote Black Friday sale products from various Amazon storefronts using just a single link. This ability to geo-locate pages using a single link by Geniuslink makes life simpler and increases commissions. I mainly use the United States, United Kingdom, Canada and India’s Amazon storefronts for Associate Central affiliate signup because these are the countries where most of my customers come from. All these analytics help me understand my customers better so I can fine-tune my marketing campaigns for better performance. I highly recommend Geniuslink to every self-publishing author. Using the right tools can make your life much easier. Being from a software background I look out for good tools that help me save time, or automate repetitive tasks. In this section, I share few tools that I have personally used – which have either saved me a lot of time or money or helped me increase revenues. So you will definitely find a tool or two that can act as a catalyst for your business in here. Most of these tools cost nothing or very minimal – and if used right they’ll certainly give you ROI of several hundred times. To make it easier, I have an exclusive invite in this section where you can reach me to get the ‘tech work’ done by me, at no cost to you. With the current state of the economy worldwide and changing business scenario, it is easier than ever for anyone to start their own online business – as long as they find a way to create and deliver value to their target group. The entry barrier is almost negligible, and returns are enormous. All that one needs is to find a hungry crowd and create value for them. ‘Kindle Self-Publishing Mastery’ is a 3-book series explaining how anyone can spend under an hour every day, use a simple step-by-step process and start from scratch to build a 5-figure passive income stream by leveraging world’s biggest self-publishing platform, Amazon. 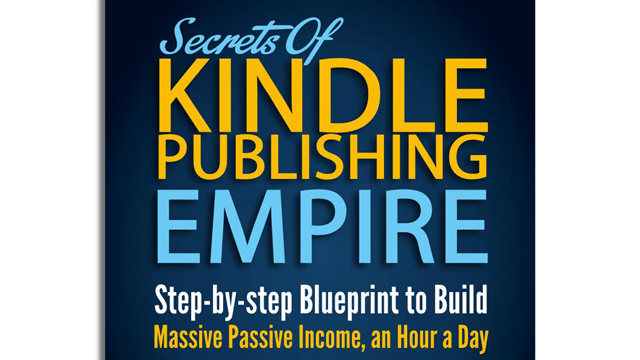 ‘Secrets Of Kindle Publishing Empire’ is the third part of the book series and explains the unique online business model to maximize revenue. The marketing techniques revealed in this book can easily fast-track business growth, leading to quicker returns. When you get the book, simply forward me the email you get from Amazon and I will give you a 30-minute passive income strategy session for free.